Led by Executive Director Kenneth Roth and Sarah Leah Whitson, director of its Middle East and North Africa division, HRW has an overall dismal record with regard to "naming and shaming" Arab dictatorships. Over the years, it has devoted few resources to opposing the daily human rights violations that are characteristic of these regimes and has even built alliances with some. In 2009, for example, Whitson visited Saudi Arabia, where, instead of speaking out against attacks on women, minorities, and others, she sought funds to expand HRW's role in the campaign to market the U.N.'s Goldstone report which falsely accused Israel of committing war crimes. HRW is a financially flush but morally bankrupt organization. With an annual budget of approximately $50 million, it is a highly visible institution with direct access to the international media, diplomats, political leaders, and United Nations bodies. Yet its documented and quantifiable behavior with regard to the Middle East demonstrates a determined effort to avert its eyes from the worst human rights abuses while focusing on post-colonial ideologues' favorite whipping boy, Israel—the only democracy in the region. HRW's Political Impact and the "Halo Effect"
The warped agenda that focuses disproportionately on the Jewish state was the basis for criticism voiced by HRW's founder Robert Bernstein in 2009 regarding the organization's failure to direct resources to the practices of totalitarian Arab regimes. Detailed documentation and global campaigns on these countries would have required hard work, including obtaining access for researchers as well as responding to threats to their lives and personal safety. Israel, by contrast, was "low hanging fruit." Access, safety, and working conditions in Tel Aviv and Jerusalem are far more comfortable for Western human rights activists (and for journalists and diplomats) than Damascus, Tripoli, Gaza, or Baghdad. The focus on Israel is also part of the wider post-colonial ideology, which prefers targeting Western democratic societies for their supposed failings. But HRW is not simply passive with respect to authoritarian Middle Eastern countries. The organization's very limited criticism and actual cooperation with closed Arab regimes has added to the protection that they receive (or extort) from other watchdog international organizations. The agenda of the U.N. Human Rights Council (or Commission prior to 2006), for example, has been manipulated by the powerful Organization of the Islamic Conference (OIC) with its rotating membership often including these dictatorships. The OIC members have had no interest in drawing attention to or investigating their own violations. At the same time, their highly biased agenda was supported by the nongovernmental organization (NGO) network active in the U.N., including HRW. Roth, as the head of HRW, indirectly acknowledged this neglect and sought to justify the selective targeting and double standards as "higher expectations" for democracies. Furthermore, in forming the Middle East and North Africa (MENA) division in the 1990s, Roth brought in Joe Stork and then Sarah Leah Whitson, both of whom had records reflecting ideologically based activism, a warped romanticism toward violent Arab strongmen, and double standards regarding human rights. HRW also has had links with Richard Falk, a "9/11 truther" (claiming that the U.S. government was involved in planning or executing these mass terror attacks) and fierce opponent of international action against the Qaddafi regime. Until recently, Falk was a member of HRW's prestigious Santa Barbara (California) Committee, and the organization supported his campaigns. However, in December 2012, U.N. secretary-general Ban Ki-Moon, British prime minister David Cameron, and U.S. ambassador to the U.N. Susan Rice condemned Falk for his anti-Semitic statements, prompting his forced resignation from the California committee and disassociation from HRW. in a highly politicized manner, not recognizing the essential political act of picking and choosing cases and priorities, and engaging with or rejecting this or that regime. Human rights are universal, and this universality dictates that all countries be equally subject to scrutiny … Human rights groups would do better to "go where the violations are" instead of endlessly balancing the saddle bags—which in the case of HRW has often meant especially focusing on Israel because it can. HRW's Middle East agenda also reflects a highly ideological foundation and starry-eyed perception of political Islam, which departs from the universal principles of human rights and grants exemptions to favorites. For example, in his introduction to the 2012 World Report, HRW executive director Roth called on the leaders of democratic countries to cooperate with the Muslim Brotherhood in Tunisia and Egypt since they "merit presumptive support." you are not a state; you are the head of an international human rights organization whose role is to report on human rights violations, an honorable and necessary task which your essay largely neglects. You say, "It is important to nurture the rights-respecting elements of political Islam while standing firm against repression in its name," but you fail to call for the most basic guarantee of rights—the separation of religion from the state. You … are so unconcerned with the rights of women, gays, and religious minorities that you mention them only once, as follows: "Many Islamic parties have indeed embraced disturbing positions that would subjugate the rights of women and restrict religious, personal, and political freedoms. But so have many of the autocratic regimes that the West props up." Are we really going to set the bar that low? This is the voice of an apologist, not a senior human rights advocate. In both his essay and this response, HRW blurs the boundaries between support for governments and human rights advocacy. The classic work of human rights organizations is to press governments on human rights issues, not drum up support for specific regimes. In examining the MENA division's activities over a number of years, the priorities are clear and consistent: Regimes such as Libya and Syria with the lowest level of human rights compliance and the highest rate of abuses, as reflected inter alia in reports by the NGO Freedom House, received the lowest level of scrutiny from HRW. Two broad quantitative indicators were employed to reach this conclusion. 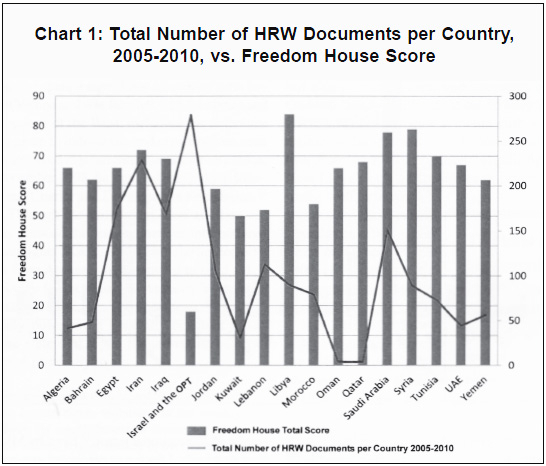 First, the number of HRW press releases, letters, and commentaries produced for each country for the years 2005-10 were tallied and then compared to the grades these countries received from Freedom House in the same period (lower scores indicate a freer or more open society; see Chart 1). Second, the number of pages of major reports and briefings published on each country were totaled (see Chart 2, page 54). Due to the high resource commitment required for major reports and the value assigned to them by HRW as reflected in their accompanying press conferences and publicity campaigns, these documents are a significant indicator of the relative priority assigned to each country. As shown in Chart 1, there is in general an inverse correlation between the openness of a society, as measured by Freedom House, and the degree to which HRW emphasized this country in their publications and related activities. While Libya received the lowest rating in terms of freedom or open society in the region (seen by its high Freedom House score), it was largely neglected by HRW—ranking eighth on its agenda as reflected in the number of documents produced during the 2005-10 period. Syria, Tunisia, and Yemen received marginally less attention from HRW in this period and also received very low ratings for freedom or open society from Freedom House. In contrast, Israel and the "OPT" (HRW's politicized nomenclature for the disputed territories of Judea/Samaria signifying "Occupied Palestinian Territories") received the greatest level of attention from HRW, both in terms of the number of individual publications and the more extensive reports. Although Iran comes in second after Israel on the scale of overall HRW publications, when focusing on the number of detailed reports, Iraq was actually second because, in true post-colonial mentality, allegations of Western misconduct in Iraq are more noteworthy. 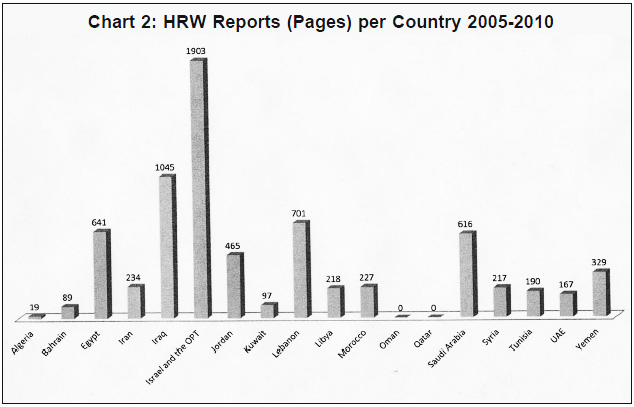 Chart 2, which displays the number of pages in the country reports that HRW published during the period under study, further highlights the disproportionate focus on Israel and the OPT, the secondary emphasis on allegations regarding coalition forces in Iraq, and the relative neglect of totalitarian regimes. HRW's reports on the closed regimes and human rights violations of Libya, Syria, Tunisia, and Yemen were limited in number and very brief, providing additional evidence that the NGO assigned a low priority and devoted very limited resources to documenting and publicizing abuses in these countries. For example, HRW's July 2011 report on Syria (which covers 2010) reviewed a decade of human rights abuses by the Assad regime, resulting in a slim 35-page publication. This was only HRW's fourth report on Syria since 2000. Its 2010 report of five years of rule by King Abdullah in Saudi Arabia was also minimal, consisting of a mere 52 pages. By contrast, HRW devoted 1,903 pages to Israel and the OPT in total. HRW explains the limited attention to the closed totalitarian regimes of MENA as the result of a lack of access, preventing effective monitoring. However, this explanation is weak and not consistent with the facts. In the examples of Tibet and China, Myanmar, and other closed states outside the Middle East in which human rights violations are widespread, HRW and other organizations publish reports, issue numerous statements, and generally attempt to focus public pressure on the countries and officials involved. Similarly, when media attention increases on an area, even in the Middle East, HRW manages to rapidly increase activities as reflected in the frequency of statements and reports despite the prior and continuing lack of access. This was the case regarding Iran following the disputed elections in 2009 and the violent suppression of protests. Similarly, with the outbreak of the Arab uprisings in early 2011 and the accompanying media attention generated, HRW dramatically increased its reports on the relevant countries. In 2011, HRW's coverage of the countries in the region increased significantly in comparison to 2010: Libya was up 478 percent; Egypt, 103 percent; Syria, 416 percent; Bahrain, 200 percent; Yemen, 178 percent; Tunisia, 78 percent. Such dramatic change cannot be fully explained as an instant worsening of human rights conditions in these countries due to the outbreak of violence or to some immediate opening of the closed structures of the regimes. Rather, this activity demonstrates the way in which HRW consistently and immediately changes priorities in response to the international media and political focus on events. HRW and Qaddafi's "Human Rights Reform"
As seen, Libya had been very low on HRW's Middle East monitoring agenda, despite the fact that the Qaddafi regime was long known as one of the world's most virulent and consistent violators of human rights as well as a major source of international terror. Even by Middle East standards, Libya was perceived as a police state, which cowed its citizens through terror, a country with one of the worst human rights records in the world. However, in 2003, following the U.S.-led defeat of Saddam Hussein, Libya's leadership announced an end to its efforts to acquire nuclear weapons technology, the voluntary destruction of its chemical and biological weapons, and a renunciation of terror. In return, Washington, London, and a number of European governments began to warm to Qaddafi, who had been previously sanctioned and ostracized. Libyan oil exports began to be used to make up some of the shortfall in petroleum products due to the war in Iraq, and in this environment, the Qaddafi family also began to receive positive Western media coverage. The poster boy for Libya's alleged human rights reform was Saif al-Islam al-Qaddafi, son of the late tyrant. Saif al-Islam's Qaddafi International Charity and Development Foundation was hailed by Human Rights Watch on more than one occasion though actual reform was thin on the ground. In June 2011, the International Criminal Court issued a warrant for Saif al-Islam's arrest on charges of crimes against humanity. 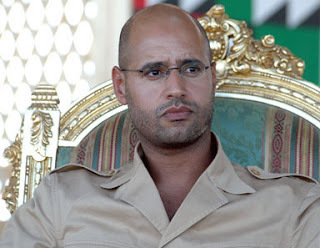 The guiding and driving force behind this Libyan about-face was Saif al-Islam al-Qaddafi, the dictator's son, considered by many as de facto prime minister and potential successor. Saif al-Islam had spent a significant amount of time living in Vienna and was familiar with the norms and perceptions of the West, including the deference often given to individuals and organizations seen to be involved in promoting humanitarian causes. In December 1998, he founded the Qaddafi International Charity and Development Foundation. limited progress with regard to allowing work on human rights violations in the country. Since its establishment in December 1998, the Human Rights Society of the Qaddafi International Foundation for Charitable Associations … has become increasingly active in the field of human rights. HRW sent its delegation to Libya in 2005—the organization's first such visit to the country. Prior to 2005, its interest in and publications on Libya were minimal with no published reports and only eight press releases in 2000-05. Its subsequent report, while critical of the human rights situation, also included reference to "a country undergoing gradual change after years of strict repression and global isolation." In 2009, Amnesty and HRW were again invited to Libya by the Qaddafi Foundation. HRW's 2009 reports and related publications included some criticism of the Libyan regime but also contained clear endorsements of the Qaddafi family and foundation. In May 2009, HRW's MENA director Whitson authored an article in the influential U.S.-based publication Foreign Policy, entitled "Tripoli Spring: How Libya's behind-the-scenes reformer is actually, well, reforming," and praised the Qaddafi Foundation effusively. Then on December 12, 2009, HRW held a news conference in Libya to present its report. Although there is no information regarding which journalists, if any, were involved, or their ability to pose uncensored questions, a leaked U.S State Department memo noted that this singular event helped to "solidify Saif al-Islam's reputation as a 'reformer.'" Just two days before our report release the Qaddafi Foundation, headed by Saif al-Islam, a son of the Libyan leader Mu'ammar al-Qaddafi, issued a hard-hitting report about human rights similar to ours. In shockingly blunt language, it challenged the role of the security agencies, questioning the "legitimacy of a government that is unable to implement court decisions" and adding: "This raises the deeper question of who is ruling the country, is it the General People's Committee [the cabinet] or is it other forces?" The language used by Whitson—characterizing HRW's Tripoli press conference as sharply critical, and Saif al-Islam's report as "hard hitting"—is highly exaggerated and transparently self-serving. In HRW's condemnations of Israel, terms such as "war crimes" and "collective punishment" are used repeatedly, accompanied by demands for international sanctions and legal action via the International Criminal Court and other bodies. But in Tripoli, Whitson used mild language, and her action items were limited to calls for more "reform." As reported by HRW, Whitson spoke of "the expanded space for public discussion in Libya" and meekly asked the regime to "revise its penal code to allow all Libyans the freedom to have such public discussion without fear of criminal sanction and stop jailing those who express criticism of the government." In sharp contrast to Whitson's praise for the Libyan report, its substance and style reflected the totalitarian nature of the regime. As described in The Tripoli Post, the organization "attributed all advancements in human rights to the establishment of the society by the Qaddafi International Charity and Development Foundation ten years ago, which, according to [Mohammad al-Alaqhi ], has been able to open some sensitive files on human rights in Libya." The halo effect generated by HRW's support and greased by petro-dollars continued to aid Saif al-Islam's quest for credibility. In 2009, he launched another organization—The Arab Alliance for Democracy, Development, and Human Rights (AADDHR)—whose ostensible mandate was reporting on human rights abuses in the Middle East. At its launch, AADDHR announced that it had consulted with "Amnesty International and Human Rights Watch about how to be an effective human rights organization." Still to be determined is whether the organizations were paid by AADDHR or the Qaddafi regime for their consultation, or whether their consultation resulted in any substantial human rights policies. Some analysts note that integrating into the community of NGOs is a strategy for increasing credibility. The issue of bribery, or perhaps "greasing the wheels," is one that lurks below the surface of any authoritarian regime's rehabilitation. In 2008, Saif al-Islam was awarded a doctoral degree from the London School of Economics (LSE). Shortly thereafter in 2009, LSE accepted a contribution of £1.5 million from the Qaddafi International Charity and Development Foundation. In March 2011, LSE established an independent inquiry to investigate links between the Libyan government and the university. The resulting report cited Saif al-Islam's reputation as a reformer as explanation for accepting the gift. Though it did not attribute this directly to HRW's encomiums, in a different forum, David Held, co-director of the LSE's Global Governance, sought to justify the school's relationship with Saif al-Islam by specifically citing his reputation as a reformer, based on HRW's endorsement, AADDHR's alleged interaction with both Amnesty and HRW, and Whitson's Foreign Policyarticle. The nature of HRW's tainted relationship with the regime reached the heights of hypocrisy in the case of Fathi Eljahmi, a prominent Libyan dissident who was imprisoned in 2004, tortured, held in solitary confinement, and subsequently died in 2009 (during the visit of another Amnesty delegation to the country). His brother condemned HRW for hesitating "to advocate publicly for Fathi's case" because it wanted to avoid "antagonizing Qaddafi." In fact, in her Foreign Policy article, Whitson briefly mentioned Eljahmi's death but then moved on to absolve the family dictatorship, expounding the slogan that "change is in the air in Libya." Saif al-Islam's dalliance with human rights was, in any event, short-lived. On December 16, 2010, he announced that he "will no longer be involved in promoting human rights and political change in the North African country." This announcement was reported in Amnesty's 2011 Annual Report but was conspicuously absent in HRW statements and publications, including their 2011 World Report. In fact, in that report, published on January 24, 2011, HRW repeated the claim: "The only organization able to criticize human rights violations publicly is the Human Rights Society of the Qaddafi Foundation, which is chaired by Saif al-Islam al-Qaddafi." Thus, HRW completely ignored the Qaddafi Foundation's own announcement that it would no longer report on human rights issues. Less than a month later, the demonstrations against the Qaddafi regime began and were brutally repressed, with Saif al-Islam going on Libyan television and declaring that the regime will "fight until the last man … to the last bullet." During the fighting, Saif al-Islam emerged as one of the major perpetrators of torture and other forms of brutality. On June 27, 2011, the International Criminal Court issued a warrant for his arrest on charges of crimes against humanity against the Libyan people, citing his "ordering the recruitment of mercenaries and the mobilization of militias and troops" and "ordering the imprisonment and elimination of political dissidents." Saif Islam in fact abandoned his nascent reform agenda long before the past week's demonstrations rocked 'Brother Leader' Moammar Kadafi's rule. ... Saif Islam last year announced his withdrawal from political life and said that his foundation would no longer focus on human rights and political affairs. While HRW commented extensively on the court's warrant and the capture of Saif al-Islam, it made no mention of its own direct involvement with him or the regime prior to the 2011 uprising. Similarly, Aryeh Neier, HRW's first executive director and present-day supporter of the group, conspicuously erased the Qaddafi connection in his recent history of the international human rights movement. During the first six months of 2012, the organization, in its new-found role as Libyan critic, listed thirty-five items in its Libya section, including press releases, statements, commentaries, letters, and U.N. Human Rights Council statements—a rate far above the average prior to 2011, further illustrating its opportunistic concern when the media spotlight shines the brightest. Often referred to and quoted as a "highly respected human rights organization," HRW's publications and submissions to various official bodies are all too often immediately accepted and repeated without a perceived need for independent verification. There seem to be no apparent consequences for their fundamental errors of judgment, no sanctions, and no mechanisms for learning from mistakes. With a semi-permanent circle of leaders—Ken Roth has been executive director since 1993; Sarah Leah Whitson has been director the MENA division for almost ten years—no transparency in decision-making processes, and no independent review mechanisms such as an ombudsman, the pressures and incentives for error correction are minimal. HRW's recent flood of seemingly authoritative statements on human rights-related developments in Libya make no reference to the earlier cooperation with the Qaddafi regime and particularly with Saif al-Islam. Gita Sahgal's critique of the organization and its record of drumming up "support for specific regimes" in the Middle East is particularly applicable in the case of pre-2011 Libya. Instead of providing the watchdog function its officials claim, and which much of international media, as well as diplomats, political leaders, and academics accept without question, HRW was very much a part of the marketing of a false "Tripoli spring" orchestrated by the Qaddafi family. For the consumers of HRW's product, particularly in the Middle East, this should be a cautionary tale. Gerald M. Steinberg is professor of political studies, the founder of the Program on Conflict Management and Negotiation at Bar Ilan University, and president of NGO Monitor. The author gratefully acknowledges the assistance and suggestions provided by Gidon Shaviv, Anne Herzberg, and Joshua Bacon. "Libya: New Era Needs Focus on Rights," Human Rights Watch (hereafter, HRW), Washington, D.C., Oct. 20, 2011. "HRW Raises Funds in Saudi Arabia by Demonizing Israel," Digest, NGO Monitor, Jerusalem, May 2009; David Bernstein, "Human Rights Watch Goes to Saudi Arabia," The Wall Street Journal, July 15, 2009. Sarah Mandel, Experts or Ideologues: A Systematic Analysis of Human Rights Watch's Focus on Israel, NGO Monitor, Sept. 2009; Robert L. Bernstein, "Human Rights in the Middle East," presentation, The Shirley and Leonard Goldstein Lecture on Human Rights, University of Nebraska at Omaha, Nov. 10, 2010; Robert L. Bernstein, "Rights Watchdog, Lost in the Mideast," The New York Times, Oct. 20, 2009. Bernstein, "Rights Watchdog, Lost in the Mideast"; idem, "Human Rights in the Middle East." Ben Birnbaum, "Minority Report," The New Republic, Apr. 27, 2010. Hilary Leila Kreiger, "We Don't Do Comparisons," The Jerusalem Post, Sept. 11, 2004. Richard Falk, "Gaddafi, Moral Interventionism, Libya, and the Arab Revolutionary Movement,"Today's Zaman (Istanbul), Mar. 20, 2011. "Israel: Reverse Expulsion Human Rights Rapporteur," HRW, Dec. 17, 2008. The Forward (New York), Dec. 19, 2012. Catherine Fitzpatrick, "Women and Islam: A Debate with Human Rights Watch," The New York Review of Books Blog, Feb. 23, 2012. World Report 2012, HRW, pp. 13-4. Fitzpatrick, "Women and Islam: A Debate with Human Rights Watch." Tim Golden, "Jihadist or Victim: Ex-Detainee Makes a Case," The New York Times, June 15, 2006; Diana Hortsch, "The Paradox of Partnership: Amnesty International, Responsible Advocacy, and NGO Accountability," Columbia Human Rights Law Review, June 7, 2010. Gita Sahgal, "Statement by Gita Sahgal on Leaving Amnesty International," Human Rights for All, Apr. 12, 2010. "A Wasted Decade," HRW, July 16, 2010. "Looser Rein, Uncertain Gain: A Human Rights Assessment of Five Years of King Abdullah's Reforms in Saudi Arabia," HRW, Sept. 27, 2010. World Report 2012, HRW, p. 21. "HRW in 2011: More Balance, Less Credibility," NGO Monitor, Jan. 9, 2012. H. Ramos, J. Ron, and O. N.T. Thoms, "Shaping the Northern Media's Human Rights Coverage, 1986-2000," Journal of Peace Research, July 1, 2007, pp. 395-6. "U.S. Relations with Libya," Bureau of Public Affairs, U.S. Department of State, Mar. 9, 2012. "Worst of the Worst 2011: The World's Most Repressive Societies," Freedom House, Washington, D.C., May 2011, p. 17. The New York Times, Feb. 28, 2010. "Libya: Time to Make Human Rights a Reality," Amnesty International, New York, Apr. 26, 2004, p. 8. "Libya: Words to Deeds: The Urgent Need for Human Rights Reform," HRW, Jan. 2006, p. 1. "Libya: Amnesty International Completes First Fact-finding Visit in over Five Years," Amnesty International, May 29, 2009. "Libya: In Repressive Atmosphere, Pockets of Improvement," HRW, Dec. 12, 2009. Ibid. ; "Truth and Justice Can't Wait," HRW, Dec. 12, 2009. Sarah Leah Whitson, "Tripoli Spring," Foreign Policy, May 27, 2009. WikiLeaks in The Telegraph (London), Jan. 31, 2011. Heba Morayef, "Is Libya Opening Up?" The Guardian (London), Jan. 4, 2010. Sarah Leah Whitson, "Postcard from ... Tripoli," Foreign Policy in Focus, Feb. 10, 2010. "Libya: In Repressive Atmosphere, Pockets of Improvement." The Tripoli Post, Dec. 12, 2009. WikiLeaks in The Telegraph, Jan. 21, 2011. Peter A. Gourevitch, David A. Lake, and Janice Gross Stein, The Credibility of Transnational NGOs: When Virtue Is Not Enough (Cambridge: Cambridge University Press, 2011), p. 21. "The Woolf Inquiry: An Inquiry into the LSE's Links with Libya and Lessons to Be Learned," Oct. 2011, p. 20. David Held, "Dealing with Saif Gaddafi: Naivety, complicity, or cautious engagement?" Open Democracy (London), Mar. 16, 2011. Mohamed Eljahmi, "Don't Let My Brother's Death Be in Vain," Forbes, June 6, 2009. Whitson, "Tripoli Spring"; Michael Weiss, "Human Rights Watch and Libya," Weekly Standard, Mar. 4, 2011. The Guardian (London), Dec. 16, 2010. Amnesty International Report 2011, Amnesty International, New York, p. 212. World Report 2011, HRW, p. 565. The Telegraph, Feb. 21, 2011. Prosecutor's Application Pursuant to Article 58 as to Muammar Mohammed Abu Minyar GADDAFI, Saif Al-Islam GADDAFI and Abdullah AL-SENUSSI, ICC-01/11, International Criminal Court, The Hague, June 27, 2011, pp. 33-4. Sarah Leah Whitson, "Libya: To oust a tyrant," Los Angeles Times, Feb. 24, 2011. "Libya: Q & A on the ICC and Saif al-Islam Gaddafi," HRW, Jan. 23, 2012. Aryeh Neier, The International Human Rights Movement: A History (Princeton: Princeton University Press, 2012); Anne Herzberg "A Partial History of the International Human Rights Movement by Aryeh Neier," SPME Book Reviews, Mar. 20, 2013. "Libya: Q & A on the ICC and Saif al-Islam Gaddafi." Technorati Tag: Israel and HRW and Human Rights Watch.